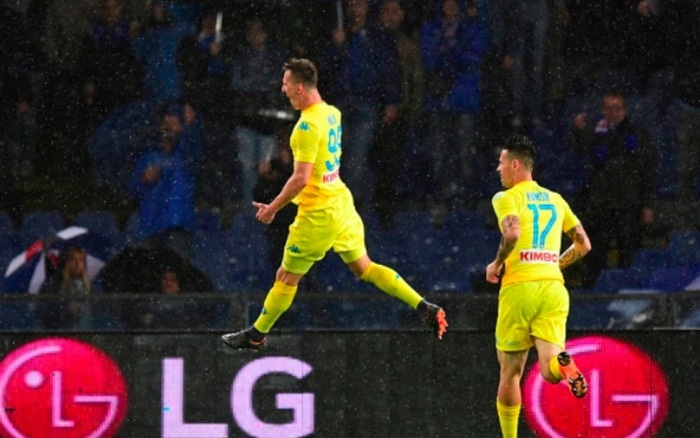 Napoli fans were left wondering what the season might have held had Arkadiusz Milik been available and selected more often as the forward scored the opening goal in a 2-0 win away over Sampdoria on Sunday evening. With Dries Mertens evidently exhausted in recent weeks, Milik has remained underused by Maurizio Sarri and it was no surprise to see the striker start from the bench again at the Stadio Luigi Ferraris, only to score within a minute of his arrival on the night that saw Juventus confirmed as champions. Despite playing for pride and little more, it was the Partenopei who tried to break the deadlock first through Mertens. The Belgian’s effort, though, was blocked on the edge of the box without threatening goal. The Napoli forward did then have the ball in the net. A cross into the box was knocked into his stride in the six-yard box and after he controlled and finished from an offside position, VAR was consulted. The decision was made to rule out the strike, although it did appear to come off the head of a Samp defender last, leaving Mertens onside. Gianluca Caprari and Lorenzo Insigne traded efforts at either end all before a quarter of an hour had been played and it proved to be from range that Napoli’s biggest threat came. Piotr Zielinski had an attempt from outside of the box saved before Mertens tried his luck again to no avail. There weren’t too many clear-cut chances in the first half, and both sides were left wanting when it came to finding that final pass as they sought an opportunity. Dennis Praet got the second half’s first long-range shot out of the way nice and early, but again his effort didn’t trouble the net before Insigne tried his luck once more, but his strike went just wide of the post. Sampdoria weren’t looking to roll over though and they did come close shortly after the hour mark through Dawid Kownacki. The Pole drove forward in possession and broke through the Napoli midfield before, believe it or not, shooting wide from 25-yards. The pattern continued when Insigne saw his shot saved by Emiliano Viviano moments later. It was from outside the box that the opening goal came through Milik. The Polish forward picked up the ball from Allan about 25-yards from goal, turned, and unleashed a powerful strike with his left foot into Viviano’s top right corner. As the game’s end drew closer it was temporarily stopped, seemingly because of something the home fans were signing, which saw Massimo Ferrero go behind the goal in an attempt to calm the supporters. One then became two through Raul Albiol of all people, who turned home a Mario Rui corner. It remained a case of too little too late for the Partenopei though as a point in the Eternal City was enough for Juventus to be crowned champions for the seventh successive season, as they played out a scoreless draw with Roma.